Add cubic inches to your Ford 351W. New Eagle forged crank with 4.00" stroke will produce 408cu.in. with a 30 thou bored block. 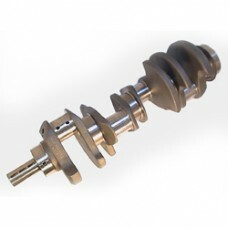 4340 forged premium quality crank for demanding applications up to 700hp. Cranks feature multi stage heat process, 100% x-rayed, magnafluxed and sonic tested, stress relieved and shot peened. Radius of .125 on rod and main journals for increased strength – requires the use of race-chamfered bearings. Chamfered oil holes, precision ground and micro-polished journals. 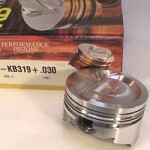 Use with 6.20" rods EAGCRS6200B3D and pistons KB319, use Chevrolet rod bearings FM8-7100CH. Multi-fit slinger allows use in early and late engines. External balance - usually with 28oz style damper and flywheel.